This is the new Basic rebuttal to the myth ‘Holistic Management can reverse Climate Change’. There’s also an Advanced rebuttal. Holistic Management is a form of grazing management that has become popularised in recent years by Allan Savory, founder of the Savory Institute. The management technique has been subject of international attention, mainly due to the infamous TED talk that Savory gave in 2014. Savory preaches that Holistic Management, applied to most of the world’s grassland, can increase productivity of farms and reverse climate change. His explanation is that livestock, grouped in large herds, will ‘mimic nature’ and increase plant growth because of this. The increased plant growth will then, according the Savory, be able to store a great deal of carbon into soil by taking the carbon out of the atmosphere, thus reducing the level of carbon dioxide contributing to the greenhouse effect. He claims all of this can be achieved in 40 years. Processes such as photosynthesis, plant respiration and bacterial respiration are all part of the cycle of carbon in and out of the atmosphere. Levels of each process determine if the carbon is stored in soil, used or is released. Plants, for example, depend on carbon for growth. In photosynthesis, energy from the sun allows plants to extract carbon dioxide in the atmosphere for its own growth, producing oxygen as a waste product. The additional carbon not used for growth is stored in soil as something called humus, which gives soil its volcanic colour. The darker the colour of the deep soil, the increased level of soil organic carbon (SOC). SOC will be increased if the level of photosynthesis is high but is also dependent on the presence of soil microbes and nutrients. The level of SOC determines soil quality and potential to store even more carbon (Ontl & Schulte 2012, Figure 1). However, stored carbon can also be lost from soils. Damage to soils, like erosion and increased decomposition, leads to an overall loss of carbon, where their potential of the soil to store carbon is outweighed by carbon losses. This carbon seeps from the soil back into the atmosphere, further increasing the greenhouse effect. Applying a new grazing technique on grasslands which have been mismanaged may indeed have positive results in terms of soil carbon storage during the first few years. But the main problem is that storage slows after the initial change, and over a long period of time (such as 50 years), the storage potential of the soil is maximised as it approaches an equilibrium (Nordborg, 2016). This effect is more observable in dry regions of the planet. This is because dry regions have lost much of their soil content, therefore having low carbon storage potential. They are at risk of completely drying out because of increasing temperatures and more at risk to the detrimental effect of mismanaged grazing (Lal, 2004).This makes it unreasonable to apply Holistic Management to such dry areas, where the intense grazing would no doubt leave soils further damaged. In fact, one of the principals of Holistic Management – focusing on using the intense hoof action of cattle – has been claimed by the Savory Institute to increase the absorption of water by soils. However, several studies in fact stated that the opposite effect was seen. When comparing land that was not grazed with land that had been managed using a short rotational grazing system (which is very similar to Holistic Management in its ideas), water infiltration was significantly reduced, and the hoof action did not improve incorporation of litter into soil (Dormaar et al. 1989, Holechek et al. 2000). Long term studies on the effect of grazing on soil carbon storage have been done before, and the results are not promising. Two studies – by Bellamy (2005) and Schrumpf (2011) – studied soil carbon data and soil organic carbon, respectively, over periods of 25 years and a range of 10-50 years in European grasslands. Bellamy’s study came to the conclusion that there was no significant change in soil organic carbon stocks over this long period of time, and Schrumpf’s study showed that as an overall, there was no clear pattern in carbon storage. Increases and decreases were observed, as well as times of stability. There was no overall pattern to suggest that grazing had any sort of positive effect on carbon storage. To expand on this, land which is already desert, such as the Sahara, cannot be revived by any management technique. The climate is too harsh, cannot support plant growth, and therefore cannot support livestock. This is the same case for land which is at high risk of desertification, in countries such as Iran and Iraq (Figure 2). This leaves semi-arid and humid land as the only potential land able to support livestock. Climate change is likely to further damage these soils further. The explanation is that, as temperature increases, soil becomes drier. The soil becomes vulnerable to erosion, less likely to retain water, and levels of soil organic content will go down as the soil gets drier (Dalias et al. 2001). The carbon will seep out from soil back into the atmosphere. 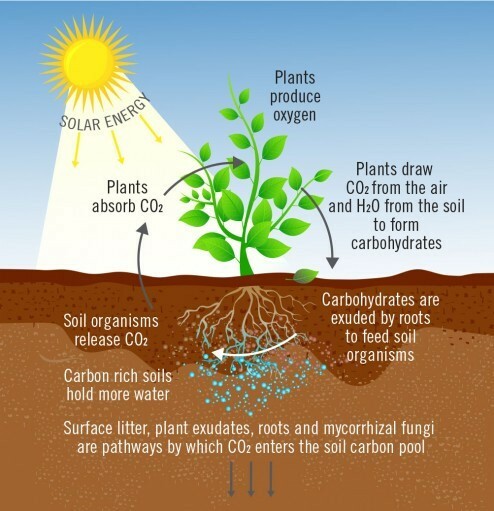 The soil changes from a carbon “sink” to a carbon “source”. In turn, this affects livestock. As the plant productivity gets worse, the livestock have less to feed on, and overall productivity of the farm goes down. Methane, CH4, is a potent greenhouse gas. It is capable of trapping heat in the atmosphere, like carbon dioxide, and is a significant factor in global warming. Melting permafrost, methane clathrates in ocean and mostly importantly emissions from livestock are responsible for a large proportion of methane that has been released into the atmosphere. When cows burp or excrete gas, they release methane (Figure 3). This methane then accumulates in the atmosphere for a period of around 12 years before it is broken down into water vapour and carbon dioxide, which are both greenhouse gases themselves (Ripple et al. 2014). As methane has a shorter atmospheric lifetime than carbon dioxide, its global warming potential is 28 times higher (Shindell et al. 2009). Part of the problem is that as the human population grows, the demand for meat grows too. At the time of writing, the population of livestock (ruminants) is increasing by 25 million per year (FAO). This has the knock-on effect of increased methane emissions, and further global warming. Allan Savory has refused to put a limit on the number of livestock that a farm can accommodate using the Holistic Management practice, claiming that bacteria capable of breaking down methane will solve this problem. He also has claimed that the number of wild ruminants in the past is equal to the current number of domesticated ruminants. This is inaccurate. The level of methane in the atmosphere today is 2.5 times higher than the level recorded before the industrial revolution (IPCC, 2001). This number has certainly increased as result of the expansion of the meat industry, in addition to other reasons listed. The methane-eating bacteria are common in both oxygen rich and oxygen depleted environments but are certainly not capable of breaking down the huge pool of methane that is present in the atmosphere today. Overall, methane emissions have continued to rise at an unprecedented rate over the past 250 years. Reducing livestock-based methane emissions will have a positive effect on global warming. For Holistic Management to work, there must be a balance between the amount of methane produced by livestock and the amount of carbon stored, which is known to be small. Because of the complex nature of carbon storage in soils, increasing global temperature, risk of desertification and methane emissions from livestock, it is unlikely that Holistic Management, or any management technique, can reverse climate change. Studies of several grazing techniques and carbon storage have produced no ground-breaking results to suggest that Savory’s idea is doable. With increasing temperature, the ability of soil to store carbon will decrease, and grazing will likely speed up the process of desertification. Finally, methane emissions from cattle are currently too high, and their effect on global warming cannot be ignored. Adding more livestock to the planet will not help this. Bellamy, P.H. et al., 2005. Carbon losses from all soils across England and Wales 1978-2003. Nature, 437(7056), pp.245–248. Dalias, P. et al., 2001. Long-term effects of temperature on carbon mineralisation processes. Soil biology & biochemistry, 33(7), pp.1049–1057. Holechek, J.L. et al., 2000. Short-duration grazing: the facts in 1999. Rangelands Archives, 22(1), pp.18–22. Johan F. Dormaar, Smoliak, S. & Walter D. Willms, 1989. Vegetation and Soil Responses to Short-Duration Grazing on Fescue Grasslands. Journal of Range Management, 42(3), pp.252–256. Lal, R., 2004. Soil carbon sequestration to mitigate climate change. Geoderma, 123(1), pp.1–22. Monica Petri, Caterina Batello, Ricardo Villani and Freddy Nachtergaele, 2009. Carbon status and carbon sequestration potential in the world’s grasslands. FAO. Available at: http://www.fao.org/3/a-i1880e.pdf. Nordborg, M., 2016. A critical review of Allan Savory’s grazing method. SLU/EPOK – Centre for Organic Food & Farming & Chalmers. Available at: http://publications.lib.chalmers.se/records/fulltext/244566/local_244566.pdf. Ontl, T.A. & Schulte, L.A., 2012. Soil carbon storage. Nature Education Knowledge, 3, p.3(10):35. Schrumpf, M. et al., 2011. How accurately can soil organic carbon stocks and stock changes be quantified by soil inventories? Biogeosciences , 8(5), pp.1193–1212. Shindell, D.T. et al., 2009. Improved attribution of climate forcing to emissions. Science, 326(5953), pp.716–718. Thornes, J.E., 2002. IPCC, 2001: Climate change 2001: impacts, adaptation and vulnerability, Contribution of Working Group II to the Third Assessment Report of the Intergovernmental Panel on Climate Change, edited by J. J. McCarthy, O. F. Canziani, N. A. Leary, D. J. Dokken a: BOOK REVIEW. International Journal of Climatology, 22(10), pp.1285–1286.